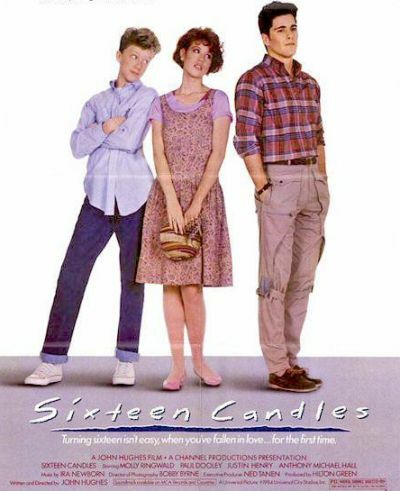 Sixteen Candles. Universal Pictures 1984. From what I’ve read about the plot… haven’t I seen this movie? Wait, no. It’s just that half of the teen angst movies in existence use similar plots. Molly Ringwald won’t be happy with anybody but the most popular boy in school, while there’s a dorky kid hovering over her who’s got a crush on her. There’s also something about her family forgetting her birthday, so she’s extra keen to get noticed by said popular boy. I’d rather not be so sarcastic, but it’s such a stock story. It’s going to have a lot to make up for in the execution. Sam’s family is so caught up in her older sister’s wedding the next day that they completely space her 16th birthday. On top of that, a Geek her house is invaded by annoying relatives and a creepy Asian student. There might be some redemption to her awful day if she could get with Jake Ryan, the super popular athlete. But Jake’s dating the prom queen and Sam’s too shy. Little does she know she’s got Jake’s attention. I was actually surprised by the plotting of the story. The Geek (that’s what he’s credited as, which is still better than Farmer Ted) is legitimately an insufferable dork at first, but he’s not starstruck by Sam, he’s just trying to be a stud. The two eventually come to understand each other as people, but just in a friendly way. The better for Sam to get what she wants. The other surprise in the plotting was odd. After act two, Sam’s story practically ended. She made peace with her lousy day and got recognition from her family about her birthday. Then for half an hour, while she’s asleep, the story follows Jake, Ted, and Jake’s girlfriend. If I wasn’t as invested in Sam’s story at that point, I probably would have enjoyed this sequence more, because this is when things really get funny. I was going to say that Jake and Ted should have had stronger scenes earlier, but they did. It just amounts to the ostensible lead being absent for almost a third of the movie. Not only do I think I’d enjoy this movie more on a repeat viewing, I’d welcome it. It seems accessible in a way Weird Science may not have been, and fun in a way I didn’t find The Breakfast Club to be. Sam’s story isn’t very funny, but she’s the straight character and often the only sane one. Watch this movie: as an angst story in a world of comedy. Don’t watch this movie: with the whole family (It’s PG, but it would be a hard PG-13 or soft R now that we have those ratings).